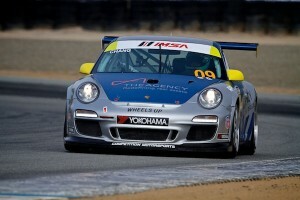 Monterey, California — With an impressive five-car lineup for the second event weekend of the 2014 IMSA GT3 Cup Challenge USA presented by Yokohama season, Competition Motorsports got off to a strong start in qualifications at Mazda Raceway Laguna Seca on Saturday. Young Michael Lewis led the charge, taking his first pole in GT3 Cup Challenge USA competition in just his third start in the category, with his fellow Competition Motorsports teammates also posting strong results during the half-hour session. Michael Lewis and David Calvert-Jones will again contest the Platinum Class championship with the all-new Porsche GT3 Cup machine in tomorrow’s race, with Fred Poordad, Blair Chang and Michael McAlister ready to take on the Gold Class championship. The California-based team came to the 2.238-mile, 11-turn circuit, including the famous “corkscrew” in scenic Monterey, California fully prepared to perform at the highest level. Ahead of qualifications, the team had two quick practice sessions on Friday afternoon to dial the cars in, and made consistent progress through the weekend. All of the cars consistently running in the top-10 throughout both sessions with Lewis consistently setting the pace ahead of the combined-class field. Saving his best for last, Lewis will start tomorrow’s race first place on the grid after throwing down the fastest lap time of qualifying on his very last lap. His time of 1:27.786-seconds found an extra tenth of a second ahead of second place. 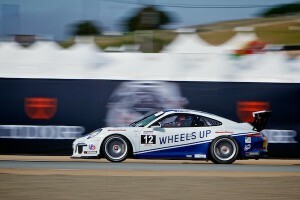 Calvert-Jones ran consistently throughout the session and will start on the fifth row of the grid for Race 1 on Sunday. In the Gold Class, Poordad led the Competition Motorsports effort with a solid fifth place starting position after an unscheduled tire change left him just outside of the pace he wanted. The Gold Class championship leader had been hoping for a front row start, but knows he will have the chance at some upward mobility on Sunday. Chang filed in just behind him in sixth position after strategically choosing to back off a bit, save some laps and some critical Yokohama Tire for his race on Sunday. 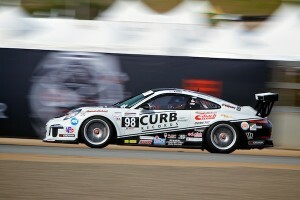 McAlister will start the first race tomorrow in 11th position. The first of the two 45-minute races Sunday will go green at 9:00AM (PST) with the second set for later in the day at 5:15PM (PST) following the TUDOR United SportsCar Championship races. 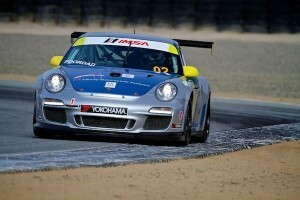 Timing and scoring can be followed live at imsa.com. This entry was posted in News on May 3, 2014 by admin.